Did I mention that these lists of “undesirable” sites are compiled most probably by our illustrious Jamal Dawood, the guy implicated in the bandargate scandal for accepting a kickback of BD2,200. Yes I know he’s cheap, and he’s still running for parliament! The guy has no shame whatsoever! "It doesn’t matter if you are a Bahraini, Indian, Sudanese, Saudi, Kuwaiti or Plutonian. 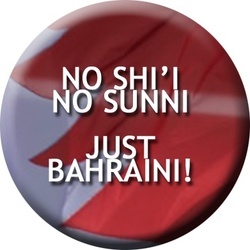 Show your support for us Bahrainis who want to live as a SINGLE nation away from sectarianism...Let us tell everyone that we will not stand by idly while some scabs diligently try to destroy our lovely country."